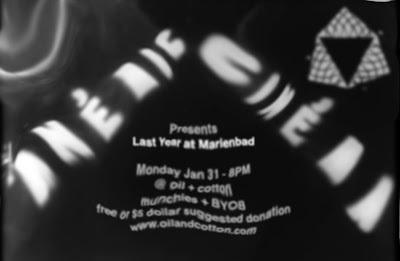 Join us on Monday, January 31st at 8pm for the first showing of our ongoing film series curated by the lovely and talented Sally Glass. Last Year in Marienbad is a 1961 French film directed by Alain Resnais. The screenplay is by Alain Robbe-Grillet. Through ambiguous flashbacks and disorienting shifts of time and location, the film explores the relationships between the characters. Our film will be projected on a large wall for your viewing pleasure. Free or $5 suggested donation. Could be the best film ever made.